Viva City, Ulaanbaatar by Soyol-Orgil E.
We’ve never been to Mongolia before ― not virtually and certainly not in real life ― so today’s trip is incredibly exciting. The world’s least densely populated country, with its complex history, rich culture and sweeping landscapes was an enigma to both of us. Somehow we had to narrow down the list of suggestions offered up by friends, and after negotiations that admittedly may have become a little tense on occasion, Leroy and I boiled it down to this: we’d explore Ulaanbaatar (translated as ‘Red Hero’) in the morning and go searching for wild horses in the afternoon. We arrived in the centre of Sükhbaatar Square just before dawn, a vast public plaza surrounded by so many historically important buildings it was almost overwhelming. I could imagine what it would be like in winter; a vast, bleak expanse encircled by the city, and beyond that the mountains. On this May day, though, the temperature was a balmy 20° Celsius and predicted to reach 30. The air was dry and, despite the slight haze of pollution, perfect travelling weather. To find our bearings and acclimatise to the slight shock of our rapid transition from a cool autumn day in Australia, we wandered the perimeter of the square, deciding what we’d like to come back and visit later when things were open. As usual, the need for caffeine drove us out of the square and towards Cafe 999, a recommendation from a friend. 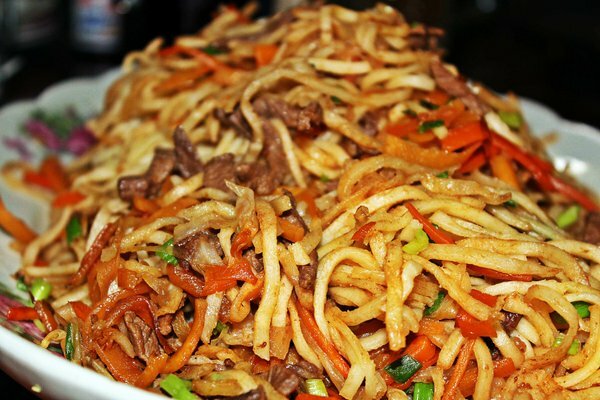 We had decided to forgo a good espresso in one of the many tourist cafés in the streets nearby for the opportunity to experience a more authentic Mongolian breakfast. On vinyl chairs under fluorescent lights, we joined sleepy business people in suits and visiting animal herders in traditional clothing, ordering Tsuivan noodles (small dishes of noodles mixed with slivers of meat and vegetables) and three-in-one instant coffee. Perhaps I should have ordered the traditional Suutei-tsai (milk tea), but I am a coffee drinker, not a tea drinker and my choice was easy. The coffee came in a brightly coloured foil sachet, mixed with powdered milk and sugar. All we had to do was tear off the corner, tip it in our mugs of boiling water and stir. While drinkable, it was probably worth it more for the experience than the taste. From there we decided to walk the few kilometres to the Winter Palace of the Bogd Khan. The walk gave us an opportunity to see more of the city while we waited for opening time. Built around the turn of the 20th century, it was the home of Mongolia’s last king (khagan) and the eighth living Buddha, the Bogd Khan. Unlike the Summer Palace, which was completely destroyed in the 1920s by the invading Red Army, the Winter Palace was spared and turned into a museum. With six temples on site, filled with Buddhist art and sculpture (and large number of taxidermied animals that may have once been part of the Bogd Khan’s personal zoo), there was a lot to see. I don’t fully understand the intricacies of 19th and 20th century Mongolian history, but in a nutshell it looks something like this. In 1911 Outer Mongolia declared independence from the newly-formed Republic of China, something the Chinese were very unhappy about as they considered the region part of their own territory. Russia waded into the argument and an agreement was forged between the three countries that Mongolia would be considered autonomous in terms of its internal governance, but that the Chinese would retain control of foreign policy (and so on). This agreement was disrupted as Russia started to lose its influence in Asia, thanks to the First World War and Russian Revolution. Feeling threatened by Russia, the Bogd Khan asked China for military assistance in 1918. This backfired somewhat, as Chinese forces moved in to occupy Outer Mongolia. The Chinese troops were then routed by the White Russian army. In 1921 the Soviet Red Army ousted the White Russians, with assistance from disenfranchised Mongol nobles unhappy living under Bogd Khan’s rule. Mongolia became a Marxist state almost overnight, and stayed that way for almost 70 years, until the collapse of the USSR in 1990. As I said, complex. After a quick bite to eat somewhere, we’re off to Khustain Nuruu (‘Birch Mountains’), a 50,000 hectare national park around 100 kilometres south-west of Ulaanbaator. With the help of a local guide, we’re going in search of takhi, the only wild horses in the world never to have been domesticated. Officially known as Przewalski’s horse (she-VAL-skee), these animals were until recently declared ‘extinct in the wild’. Thanks to various captive breeding programs and reintroductions into the wild, populations of the horse are reestablishing themselves in Mongolia and Russia, including one in the Chernobyl Exclusion Zone. The other unusual thing about them is that they have 66 chromosomes, unlike ordinary horses that have 64. Breed a takhi and an ordinary horse, and you’ll have an animal with 65 chromosomes. 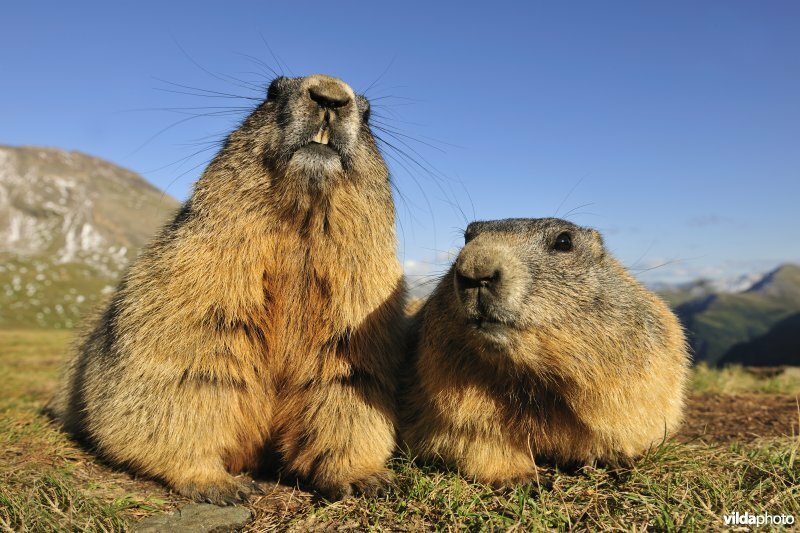 With any luck we’ll also spot some of the 44 species of mammals that have been found in the national park – some red deer, perhaps, or Mongolian gazelle, wild sheep, ibex or Mongolian marmots. Maybe even grey wolves or Eurasian lynx if we’re really lucky. 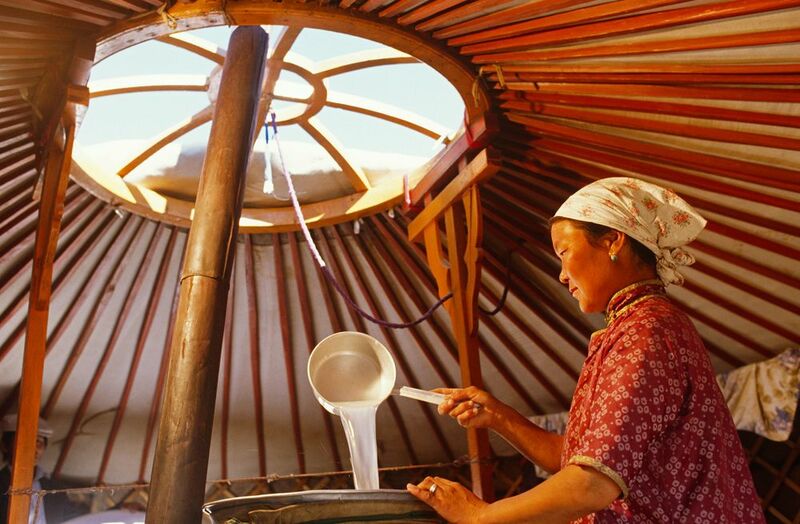 Our guide Altan emailed us the other week to ask if we’d like to take up an invitation to meet a family living a traditional nomadic lifestyle, and stay on for dinner in their ger (‘yurt’ is the Russian term). How could we turn down an invitation like that? Apparently we will be offered a cold glass of the potent arkhi on arrival, a spirit made of fermented yak’s milk. Altan politely suggested that, as first-timers, it would be advisable to drink it quickly.